Large-scale paintings and sculptural hybrids reveal the expressive range of women artists in NO MAN’S LAND: Women Artists from the Rubell Family Collection, on view from September 30, 2016, to January 8, 2017. Isa Genzken, Schauspieler, 2013; Mixed media, 72 1/4 x 18 1/2 x 10 1/2 in. The National Museum of Women in the Arts is collaborating with the Rubell Family Collection (RFC), Miami, to realize a new vision for the exhibition that opened at the RFC’s space in December 2015. The exhibition features 37 women artists whose aesthetically diverse work addresses wide-ranging intellectual and political themes. Although women historically had limited access to training and opportunity in the traditional fields of sculpture and painting, the title of the exhibition suggests “a space free from the rule of any sovereign power” where women artists are able to adapt and modify these mediums. The highly focused selection of paintings and sculptures emphasizes the female body and the physical process of art-making. Ever since the feminist art movement of the 1960s and ’70s, these two themes have become prevalent avenues for experimentation, play, and subversion. 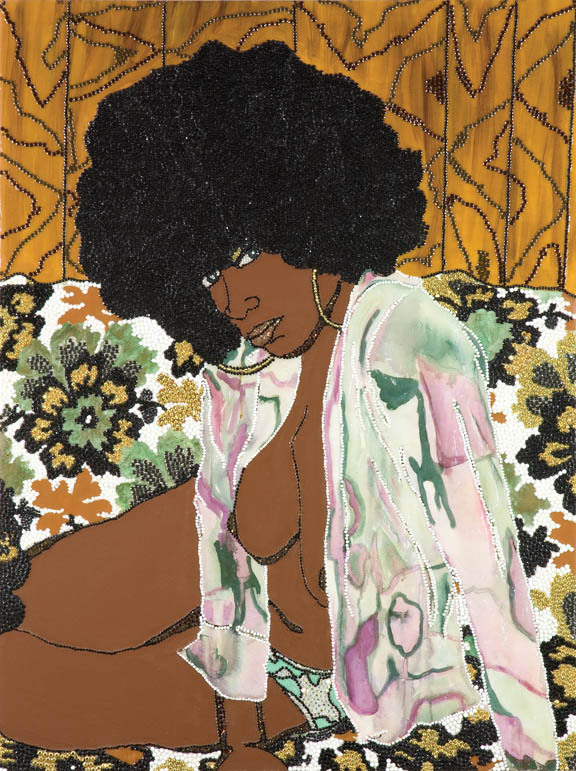 Mickalene Thomas, Whatever You Want, 2004; Acrylic, rhinestone, and enamel on panel, 48 x 36 in. During the feminist art movement, women artists claimed ownership over visualization of the body. Artists in NO MAN’S LAND explore this history and experiment with the expressive potential of the female form. Some artists, including Cecily Brown and Mickalene Thomas, adapt the art-historical theme of the odalisque by transforming its typically passive character. Others such as Hayv Kahraman use portraiture as a space for self-expression. Many of the works on view signify broader ideas about culture, gender, and ethnicity. For artists in NO MAN’S LAND, the physical process of making is key to developing meaning, exploring intellectual conundrums, and conjuring psychological experiences. Painters and sculptors eliminate hierarchies among mediums by disrupting conventional ideas about women and handcraft. Historically defined as “women’s work,” handcraft remains a gendered topic in art. Artists including Analia Saban, Rosemarie Trockel, and Shinique Smith focus on unconventional materials or labor-intensive techniques. They upend tradition to suit their aesthetic and intellectual purposes. Visit the exhibition before the public during the opening reception on September 29, 2016. See the full calendar of events for NO MAN’S LAND. —Francisca Rudolph is the fall 2016 publications and communications/marketing intern at the National Museum of Women in the Arts.